Neven Maguire, well-known Head Chef and owner of MacNean House and Restaurant in Blacklion, Co Cavan, was inducted into the Food & Wine Magazine Restaurant of the Year Awards 2015 ‘Hall of Fame’ on Sunday, August 30th at a sold-out awards ceremony at the InterContinental Hotel in Dublin. Neven received the award for his years of commitment and dedication to the Irish food industry. 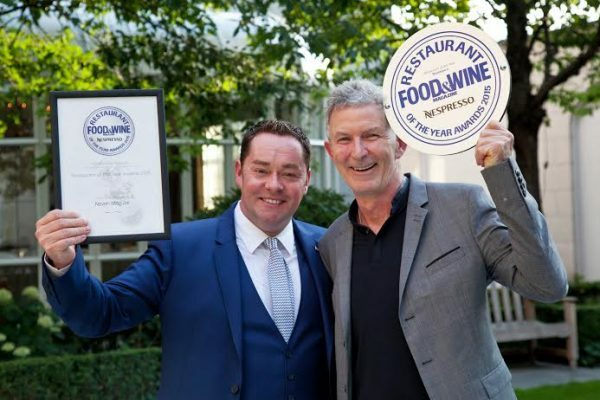 Food & Wine Magazine’s Restaurant of the Year Awards are one of the most prestigious culinary awards in the Irish calendar and celebrated their 15th anniversary this year. “I’m so happy and proud to receive this Hall of Fame award and had a wonderful time at the awards ceremony. I’m following in the footsteps of some fantastic chefs and it’s humbling to be considered against such stiff competition and high standards on the Irish food scene and to be recognised by my peers. 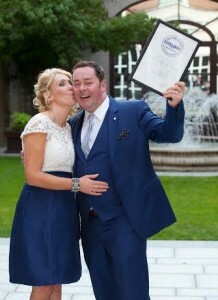 I would like to thank my wife, Amelda, all the team at MacNean House and Restaurant and our customers for their continued support and loyalty,” said Neven Maguire, Head Chef/Owner of MacNean House & Restaurant and the Neven Maguire Cookery School. and mentor, Ross Lewis. Another recipient of the award on the evening was Biddy White Lennon who Neven considers to be a real champion and ambassador of Irish food. This award kicks off an important week for Neven, as his new cookbook, ‘The Nation’s Favourite Healthy Food – 100 Good For You Recipes’, will be on shelves this Friday, September 4th. In this fresh, new collection of recipes, Neven shows that healthy eating doesn’t need to be complicated. The book offers 100 new, light and modern recipes – each of them a healthy choice. Since Neven took over the family business in 2001, MacNean House & Restaurant has been consistently winning awards for its food, service, wine offer and overall dining experience. Neven was also recently awarded ‘Best Chef in Ulster’ at the prestigious Irish Restaurant Awards 2015. In addition to his Neven Maguire Cookery School, where Neven presents a range of exciting cookery classes for all skill levels, he has also launched his exclusive ‘The Chef’s Table’ dining experience. Hosted in the beautiful and private surrounds of his cookery school, Neven and his team cook in front of diners and present the restaurant’s acclaimed Tasting Menu. Accompanying wines are also presented and served by the restaurant’s sommelier. Neven is currently filming his new series of ‘Home Chef’ for RTÉ with previous series being shown in the US (on PBS) and the UK (UKTV Food). Neven Maguire’s ‘The Nation’s Favourite Healthy Food’ is available in stores nationwide and online fromFriday September 4th, priced at €22.99. See nevenmaguire.com.